Home Expert Advice Skincare Advice Acne & Breakouts Can At-Home Light Therapy Help Acne? Whether done at home or in a dermatologist’s office, there are two types of light used on breakouts: blue light and red light. 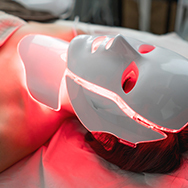 Both are believed to target specific acne triggers, using these machines that deliver these two different colors and intensities of light-emitting diodes, or LEDs. When use with a medication applied to the skin, treating acne with light is also known as photodynamic therapy (PDT). Unlike some light-emitting treatments, LED light therapy for acne can be done no matter your skin color; however, as stated above, it really isn’t as successful or worth the extra money and time it takes versus conventional acne treatments with mounds of research establishing their benefit. While that’s encouraging, the downside is that blue light presents some amount of risk to skin that shouldn’t be ignored: Routine exposure can be damaging to overall skin health and promote signs of aging. Of course, taking steps to protect skin twice daily with an antioxidant-rich skin care routine can help.